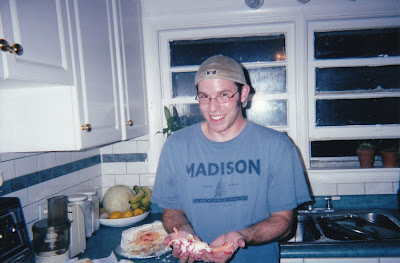 When I got back from studying in North Carolina for a few months, my awesome friends held a party to welcome me back. They also baked me a cake. It had an unusual shape; round, but tapering on one side more than the other. It was completely smooth and white. My friends insisted that I be the one to cut the first piece. I did so, slowly. 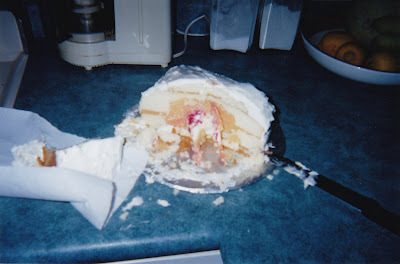 The knife went through the first few layers like it would through a normal cake. But as it got close to the center, it got easier to cut, then hard again, as it hit something tough. I sliced once more, then pulled the piece of cake out. Inside, I saw that the middle was filled with a gooey custard centre. There was also something sticking out of it. A little rubbery orange thing that appeared to be oozing red stuff. I said: "Is that...a chicken?" And then it all came together. The cake was a giant egg, with yolk and a bloody dead chicken inside. No, it wasn't real, but I damn well thought it was at first. The red food colouring really sold it. And as with all of our ugly cakes, except for the rubber chicken, it was completely edible and delicious. 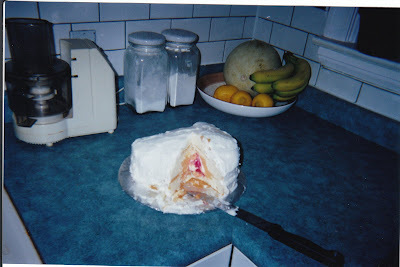 I also found pictures of two other ugly cakes. I'll post those sometime soon. See also: Other Ugly Cakes. That is just fucked up. Dude, I mean no disrespect but that is groooooooooooooooooooooooos looking. Butchie saying something's fucked up? That's fucked up. AG: I think it's beautiful. I'm not weird. You're all weird for not appreciating the subtle, mysterious beauty of chickencake. I think it looks good, but then again I love eating.